The Fill in the blanks allows elearning designers to create cloze tests. Portions of words or sentences are removed from a text and the learner is asked to replace the missing text. Fill in the blanks cen be used effectively in language learning. A Fill in the blanks test asesses the learner's ability to understand context, vocabulary or grammatical concepts in order to correctly replace the missing pieces of text. In addition to native and second language learning, Fill in the blanks can be used to test the learner's ability to reproduce facts or mathematical inferences. Fill in the blanks can be used stand-alone or they can be used in Question sets, Interactive videos or Presentations. Either way, they are created in the same way. Navigate to the menu that enables you to create new content. In Drupal, you select Interactive content. In WordPress you press Add new under H5P Content in the admin menu. Select the Create option for H5P. If you find Fill in the blanks in the list of Content types, skip to Step 1. You will now find Fill in the blanks in the Content type list when creating a new H5P. In this tutorial, we'll use trivial facts about strawberries, English grammar and arithmetics to create a Fill in the blanks. The strawberry is a juicy, edible fruit which has a red color when it is ripe. Tom has 2 strawberries. Jill gives him 4 more strawberries. Now, Tom has 6 strawberries. We'll test the learner by removing the words highligted with bold text above. These will be our blanks. In Drupal you go to Create content and select Interactive content. In WordPress you select H5P Content and Add new from the admin menu. Then select the Create option for H5P and choose Fill in the blanks from the list of Content types. In this tutorial we'll focus on creating the Fill in the blanks content. The content creation happens in the top part of the editor, so this part of the editor will be our focus here. 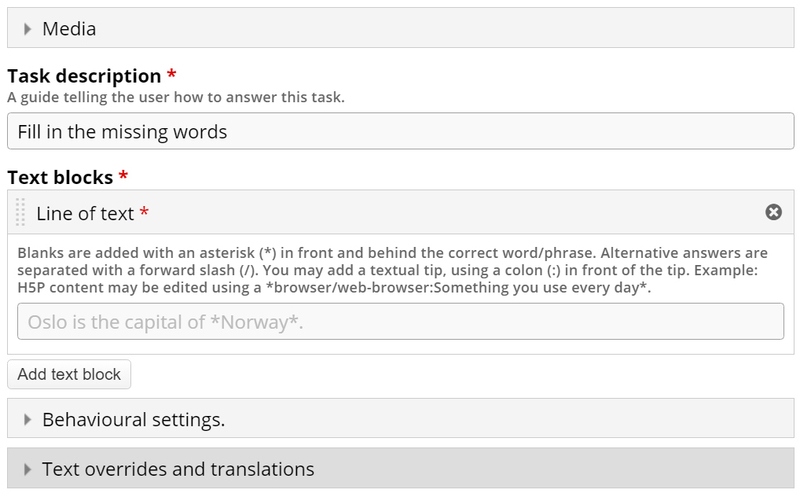 The Fill in the blanks editor consists of Task description and Text blocks. In the Task description field we give the learner basic instructions or introduce the problem to be solved. We'll use this text for the Task description: Insert the missing words or expressions. Under Text blocks we add our three sentences and define which words are to be remove for the learner to identify. We can add multiple text blocks, and we can remove multiple words in each text block. By default, only a single Text block is displayed when you create a new Fill in the blanks. Because we have three sentences, we would like to add two more Text blocks. Press the Add text block button twice to add two more Text blocks. In the screenshot above, we have used the text formatting toolbar to highlight strawberry in italics. The strawberry is a juicy, edible fruit which has a *red* color when it is ripe. Tom has 2 strawberries. Jill gives him 4 more strawberries. Now, Tom has *6* strawberries. In this last sentence, we want to allow the learner to insert both the number 6 as well as the word six. Tom has 2 strawberries. Jill gives him 4 more strawberries. Now, Tom has *6/six* strawberries. button in the top left corner of the Text block. Check the Enable "Try again" button checkbox to allow the learner to try to solve the Fill in the blanks multiple times. If you include Fill in the blanks in Question sets, Interactive videos or Presentations, you might want to consider whether you want the user to only get one chance to solve the task. In this tutorial, we'll leave this option checked. In this tutorial, we are not concerned whether the learner uses capital letters or not when inserting the missing text. We therefore uncheck the Case sensitive checkbox. 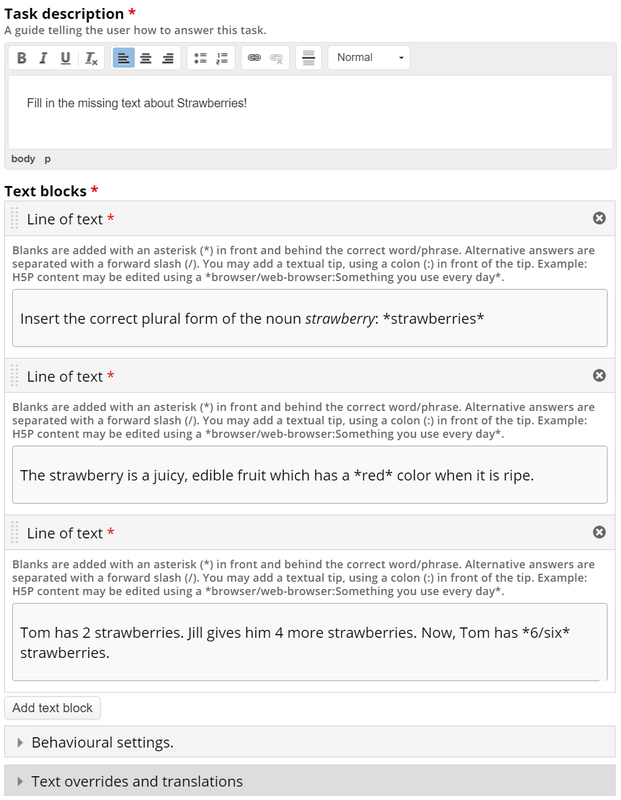 Example: The learner will get a correct answer when inserting both Strawberries and strawberries in the first sentence. Save the node/article to view your finished Fill in the blanks. You should now have the same result as the example on top of this page. It would be great to be able to add images easily to fill-in-the-blank questions (as it is with multichoice questions)! I posted this elsewhere but this blog is more appropriate for my post. I want to add mathematical symbols to text blocks like, square roots or numbers raised to power but I'm not able to do this? Can you please confirm whether this is possible or not? Not possible out of the box. ndla.no is using a graphical math editor and MathJax to display the formulaes. They have a custom drupal module that adds the tags they need and the editor to the H5P wysiwyg text editor. just a clarification about an old comment on the graphical math editor used by NDLA. Hi - just wondered if the Drupal module is avaialble to be shared? Hi Tom, thanks for your reply but I wasn't meaning the official H5P Drupal module. I was referring to the custom module developed by the NDLA and mentioned in the comment above... "They have a custom drupal module that adds the tags they need and the editor to the H5P wysiwyg text editor." You can look at NDLA's code here. Note this is for Drupal 6. How can I create questions which are like fill-in-the-blanks questions but each blank is a drop-down list for the user to select options from? There are no such content type at the moment. You would have to implement a content type for that. It is a quite common content type so I'm sure someone will implement it sooner or later. Am developing a presention, my first slide has a simple form (Name, Age etc). The user just as to type in the details. I need no validation. Is this possible ? Also can we customize the font family and color? I would try with exportable text for the form fields. For regular text areas in Course Presentation H5P has a feature for selecting font color and size, but not for font family. You could develop such a feature yourself if you are or have access to a developer. Remove the embed option for my users on my site? I'm not sure this is the right place but I'm a bit lost. I'm not using Drupal or Wordpress etc and so cannot install the appropriate plugin. I can use the EMBED option very easily and have my quizz appear nicely on my site but then the options EMBED and DOWNLOAD are also available to my users and I don't want that. Is there something I'm doing wrong? by simply removing the option after embedding on site? So here's what I did: I first checked the option EMBED so I could embed the quizz on my site. Then I edited my quizz on the H5p.org platform and removed that option. Now the quizz is still up on my site but without the two options available to my users. Hope that works!! Good to hear you figured this one out. In the future the embed-code should probably be available also in the editor, so you don't have to toggle embed to get the embed code. If you select this option, please note that the answers will only appear after the user clicks somewhere off of the text box the user just typed in. This is fine as long as there is another empty box for the user to click into and type an answer. But once the user gets to the last one, they have to know to click off somewhere (anywhere) just to see the answer since there are no more empty boxes to click into. Since users are most accustomed to completing interaction with a "Submit" action, this may leave some users disoriented and uncertain about what to do next. The requirement to do this extra "click on nothing" on the last item is not intuitive. There should be something to click on after the last item to reveal the last item's result. What is curious is that when the user clicks on the "Continue" button, it shows the solutions -- it does not cause the video to continue like it does for other interactions. I recommend changing the Continue button to say "Show solutions", and then upon showing results, replace it with the actual Continue button that restarts the video. Maybe the check button should be available even if the "Automatically check answers after input" is enabled? Do you think that would solve it? For the Continue button in Interactive Video, I am not able to reproduce this on h5p.org. Is this something which is publicly available, or you could recreate here on h5p.org? Upon rechecking yesterday's work, the Continue button is now doing what it normally does -- cause the video to resume playing. (I am working on a local installation of Moodle on my laptop Macbook Pro). Check button: Yes, I agree there should be something obvious for users to click once completed with the fill in activity. Text block editor + Undo/Bullets/Numbers? The Text Block Editor is somewhat basic. What it be possible to add Undo, Bulleted and Numbered List? It is possible, but technically it would make Fill in the blanks a little more complex since the input field is a mix of defining blanks and formatting. Afaik, none is currently working on this, though. Hi, sorry for getting back on this only now: I have been pretty busy last few weeks. Thanks for your swift reply: I understand, it would have been 'nice-to-have'. Moodle Plugin: no 'duplicate' option? I built some Fill-in-the-Blanks in my Moodle install. It appeared to be not possible to duplicate an exercise as is the case with Moodle based Activities and Resources. A duplication option for h5p Activities in Moodle would be very time-saving. Or is there a workaround? Choose the file downloaded in 1), and save the activity. Thanks for the tip! I'll try this one. Score of Points to reflect number of corrections? The 'Score of points' now seems to reflect completion status only. It does not seem to consider the extent to which a student had to correct a wrong answer. If so, would it be possible / an idea to build this in? Same for situations in which a student chooses to 'try again' ? That sounds like a great idea. I think that will also give instructors a much more detailed understanding of how well their students are grasping the material. Hopefully a developer from the community will be inspired and pick it up! Hi, sorry for getting back on this only now; I have been pretty busy. Thnks for your swift and positive reply. I just posted a Feature Request. How easy and powerfull. This is realy amazing. Unfortinaly only audio is not supported yet. Is there a way to escape H5P intepreting : and /? No, there is no escape. But there is a ticket registered on it, and hopefully it will get fixed soon. How can I add * as not a replace mark? I am trying to make an exercise for programming courses and I need to add * as an operator. How can I add * without taking it as a replace mark? (d=b^2*a*c). Escaping doesn't appear to be supported in fill in the blanks. There is a task in he bug tracker for handling it. operator * in "fill in the blanks"
How can I get operator * in Line of text inside of Fill in the blanks??? Please check my answer here. Hello, I'm trying to add feedback to a FITB question within an H5P interactive video, and I want to include feedback depending on whether the user answers correctly or wrongly. I've added some text into the message fields for both correct and wrong answers in the adaptivity section, but I can't seem to get the question to reveal the text when the question is answered? Any thoughts? Thank you for reporting this. A bug report has been filed and you can follow it here. Hi, I love this resource, but when I use it with students to help them learn html tags by filling in missing code I cannot have any closing tags as blanks as they all contain / e.g. </p> is there a way around this? It would be great if one could add audio files in the text (just in front of or after the blank or on hover instead of the tip) to dictate the missing word (for tests that do not check the understanding but only the correct writing); could that be done? That's a good suggestion Detlef. Plase head over to the Feature Request forum and post your suggestion. Please include use cases and how you would like the feature to be implemented. How can I get the answers checked? The button 'show solution' doesn't work. There is a "check" button at the buttom of the question/s. For the Fill-in-the-blank question type, is there a way to change the default characters used to identify blanks, alternative answers and answert tips? I am creating content for a computer course and want the students to answer the questions using correct command line syntax, but the default characters are ones that are often used in the command line. Therefore, when I enter the "correct" answer, the H5P question formats the answer in a strange way based on the characters that are input. (ex: correct answer is "rmdir c:\cno /f")(H5P formatted answer would be "*rmdir c:\cno /f*" but the : and / in the answer are treated as alternate answers and tips). Any thoughts on how to get around this? There is no way to get around this. However there is an exisitng task that aims to get this fixed. You can follow this here https://h5ptechnology.atlassian.net/browse/HFP-1743.